DUE DATE: Friday, Mar. 30 at 5 pm. This project consists of designing and implementing a program that plays Connect 4. It will exemplify the minimax algorithm and alpha-beta pruning. Connect 4 is a two player game (one of them being your computer program). The classical game board is a 7 (horizontal) by 6 (vertical) grid. The two players take turns dropping pieces onto the board. The player who first gets 4 of his pieces in a row wins. We will use an 7x6 board. Pieces are placed in one of the 7 columns. A column may never have more than 6 pieces in it. We label the columns A through G, and the rows 1 through 6. The player with the white pieces moves first. When a piece is placed in a column, it occupies the place that was previously the lowest unoccupied place in that column. Therefore, the first move always results in a piece occupying the lowest position in some column. The second move will either occupy the space directly above the first piece (if the second move is in the same column as the first) or the lowest position in some other column, (if the second move is in a different column than the first). row is a number from 1 to 6. For example the move (B D 3) means that a black piece is placed in column D, and it occupies row 3, since rows 1 and 2 in column D are already occupied. Every place in column, lower than row is already occupied. one of the players gets four of his pieces in a row (vertically, horizontally, or diagonally). This player wins the game, and the other loses the game. the board is full, but neither player can place four pieces in a row - the game is a draw. Your group must implement a program that plays Connect 4. Use a heuristic/evalution function of your choice (remember that the evaluation function and the utility function must coincide on final board configurations). 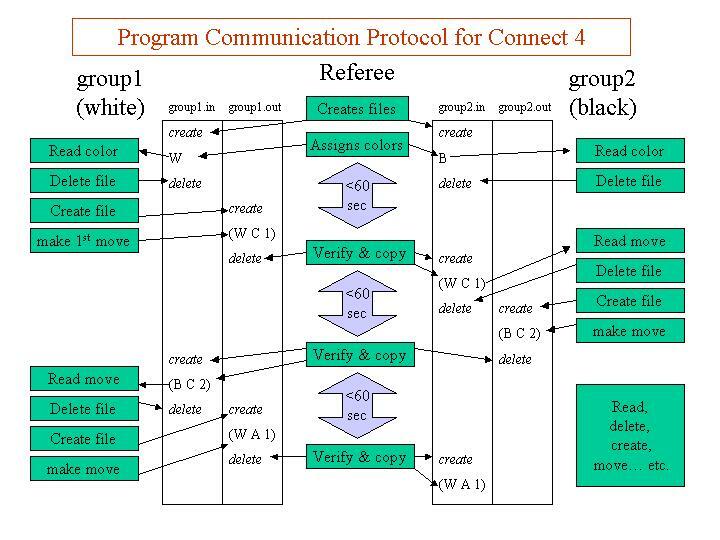 There are many communication methods that are far more elegant and efficient than this one, but the intent is that this method will result in the least elaborated code, and that it allows you to implement your program in your choice of languages. Group1 writes the first move, say (W C 1), to the file group1.out. After reading this move, group2 must DELETE the group2.in file, and before exceeding its time limit, write its move to group2.out, say (B A 1). A referee program will be provided. This referee program will be in charge of deciding which program goes first, giving each program's turn to the other program, displaying the board configuration, detecting illegal moves, and enforcing time limits. Ending the game when all positions on the board are occupied, announcing a draw. Ending the game when one of the programs makes 4 pieces in a row, announcing the winner. N.B. The time limit for the tournament will be lowered to 30 seconds. The tournament will take place on either cpu.wpi.edu or wpi.wpi.edu. Time and Date: The tournament will be held on Sunday, April 29th, 2001, at 2pm. Place: Possibly Kaven Hall computer labs, but still to be confirmed. Submission Date: Your group must submit your program by 12 noon, on Sunday. No late programs will be accepted. Turnin Command: Use the project name "tournament" for turning in your program with the turnin program. Points: Your group can earn points in two ways. Successfully completing at least one game (with a win, loss, or draw) will earn your group a number of base points. Playing well will earn your group 2 points for a win, 1 point for a draw, and 0 points for a loss. The tournament structure will be determined when we know how many groups will participate. However, every group is guaranteed at least 3 games. "In the end, there can be only one." Unless one of the finalist teams object, championship game will take place in class on Monday. Your don't have to have the same groups that you had for the original project 2, but you do need to let us know who is in your group. Below is a list of groups, and group names taken from the original projects. Please email us (cs4341_ta@cs.wpi.edu) with any additions, deletions, or name changes of group members or groups. Finding a good static evaluation function and a good heuristic depends heavily on the experience you have with the game. I recommend you start playing the game and getting the flavor of what a good Connect 4 strategy is. Also, research the strategies that other people have used for this and other games. Lots of information can be found in the references listed in your syllabus, the web, and magazine articles. Provide DETAILED time AND space complexity analyses of using minimax to explore ALL possible Connect4 moves starting with an empty board. Submit a grad_project2.txt file with a text version of your answer.